sailed. This changes Appendix A2. 2.2 Float Paks at the top of the mast are required. 2.3 The Prescriptions RRS 63.2 and RRS 63.4 are deleted. 2.4 Appendix T2 (“Penalties Taken After Race”) will be in effect. 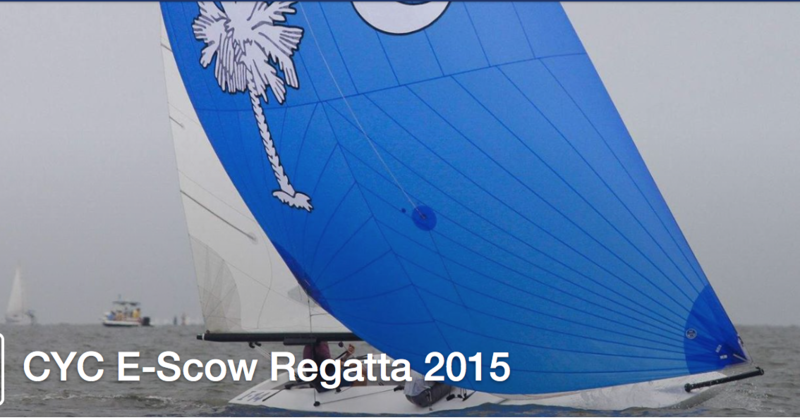 3.1 The regatta is open to boats of the E-Scow class. Entry Form, which is attached and will be available at registration. CYC web site by April 16th, 2015. Any competitor who does not do so will be charged a $10 late fee. 1400 First Warning, other race(s) to follow. a. Continental breakfast under the Boathouse on Saturday and Sunday morning. b. 1800 Saturday- Cocktail Party at Sonny Meyers’ home 17 East Battery. d. Boathouse and club restaurants are open to sailing participants and guests for the weekend (cash accepted). Appropriate attire required for the Club restaurants. 7. SAILING INSTRUCTIONS: The Sailing Instructions will be available at Registration. 50 East Bay Street, Charleston, South Carolina. 9. THE COURSES: The courses will be included in the Sailing Instructions. 10.1 RRS 44.1 (two turn penalty) is in effect except where RRS 44.1 and 44.2 are changed so that only one turn, including one tack and one gybe, is required. 10.2 Appendix T2 is in effect. A protested boat can take a Post Race Penalty of 20% or 30% prior to a protest hearing. 11.1 The Low Point Scoring System of Appendix A will apply, except that a boat’s final score shall be the sum of all races, with no throw outs (except there will be one throw out if 6 or more races are sailed). This changes Rule A2. 11.2 Nine races are scheduled. One race will constitute a regatta. 12.1 Prizes will be awarded to first through fifth, depending on size of fleet. site by April 16th. Any competitor who does not do so will be charged a $10 late fee at registration. 13.2 Registration form is attached or available at registration. Competitors participate in this regatta entirely at their own risk. See Rule 4. Decision to Race. The Carolina Yacht Club will not accept any liability for material damage or personal injury or death sustained in conjunction with or prior to, during, or after the regatta.